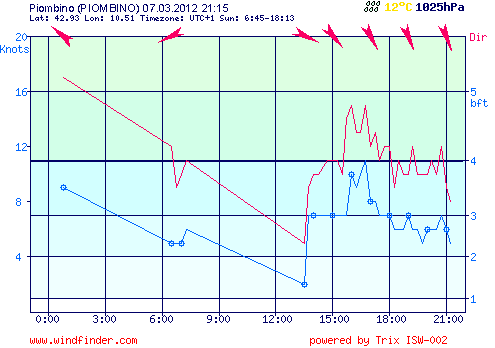 Milan-Sanremo: How fast were they going? In all the conversations about Gerrans, Cancellara, and Nibali's breakaway at Milan-Sanremo (centered on whether Gerrans' performance was "dishonorable," whether Cancellara as the strongest rider "deserved to win," and so forth), it's easy to lose sight of the speed involved. So, with a calculator in hand, let's go to the videotape. THE POGGIO: A comparison of the Poggio map with a route tracked on Ride With GPS shows that yes, as reported, the climb is 3.7k, rising 570 feet. The lead trio climb in 6:35, from the time the peloton's first rider enters the road up the Poggio to the time that the trio makes the distinctive left turn to the descent. This is an average climbing speed of 21mph, or nearly 34kph. It's reasonable to say that their top speeds while climbing were significantly higher - when Nibali and Gerrans blasted away from the pack, and when Cancellara strung things out in his bridge to them such that the elastic snapped. THE FINAL KILOMETER: Later, we see the leading trio go under the red kite, signaling 1km to go, at 12:37. At 12:47 they pass a crosswalk, and you can see the first chase group hit the same crosswalk 5" behind. They cross the finish line at 13:42, having crossed the final kilometer in 1:05 , or an average speed of 34.5mph/55 kph. At the end of 7 hours of racing! The first chase group hit the line :02 behind. Their last-kilometer speed was 36mph/58kph. If Cancellara, Nibali, and Gerrans let their average speed drop just 1 mph in that last kilometer, Peter Sagan might be the winner of Milan-San Remo by a bike throw. How fast is a team time trial? HOW FAST IS A TEAM TIME TRIAL? On Wednesday's team time trial prologue of Tirreno-Adriatico, Garmin-Barracude entered the final kilometer with 17.57 on their clock. They crossed the line at 18:58 - a kilometer in 1:01. That puts their final kilometer at almost 60kph, just over 37mph, at the end of a nearly twenty-minute all-out effort that shed four of their riders. Their 18:58 time gave them an average speed of 53.4kph (33.2mph) over the 16.9km route. HOW DOES THIS COMPARE TO OTHER DISCIPLINES? Well, the UCI's 1-kilometer track time trial record is 58.875 seconds, or an average speed of 61.2 kph / 38 mph for just under a minute - starting from a stop! And, the UCI's World Hour Record is 49.7 kilometers in one hour - averaging 49.7 kph, naturally, or nearly 31mph for an hour - three times longer than Garmin-Barracuda's Tirreno-Adriatico time trial, and with one-ninth the number of riders. WHAT KIND OF SPEED DIFFERENCES RESULT IN TIME DIFFERENCES? Greenedge, the winner, rode at 54.2kph - quite a bit faster than Columbia-Coldeportes' (the last team on the day) average speed of 49.6. But take a look at Saxo Bank, who finished 6th, just off the (extended) podium. They finished 8 seconds behind Astana, due to an average speed differential of just .35kph. And Lampre-ISD missed out on a top-ten ride by a speed differential with Lotto-Belisol of just .04kph. Time trials pose great examples of the accumulation of marginal gains. A more aerodynamic position, a faster wheel, an unfavorable start position and changing weather - an extra half-kilometer-per-hour of speed all add up when the officials stop your clock. By charting these average speeds we can see where the slimmest margins are. Those who finished 6th through 17th all had speeds within less than 1kph of each other. That looks like a pretty big drop in performance until we scale the y-axis all the way down to zero, more accurately showing the difference as a proportion of the overall (removing this "perspective" is one of the fundamental ways to mislead using statistics). Earlier today, Marco Pinotti tweeted, "Last 7 team to start are all in the 3rd part of final classification. Wind was a factor today." Following Monday's post I'm interested in the individual data that time trials generate. Can we see points of interest in graphing results? 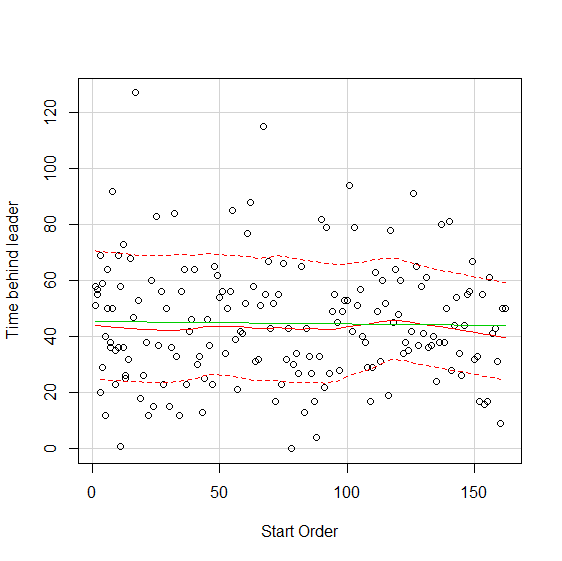 A scatterplot of finishing order by starting position shows a noticeable upward trend (the green line is the least-squares regression line). Nobody who started in the last nine finished in the top ten, and BMC, a powerful team time trialing team, finished poorly and cited the weather. What does that tell us? Compare that chart to a windchart from that day, below. Shortly after the time trial begins, the winds pick up, and halfway through the time trial, they switch from a crosswind to a headwind (most of the time trial was northbound). NB: Starting order of a time trial is not without bias. Controlling for teams' innate difference in ability, and isolating the effect of the wind, would take a different effort. With the collapse of Bob Stapleton's HTC-Highroad, a slew of talent was released to the market - all of whom managed to find a new home. Over its four year history, Highroad supplied a lot of teams with quality riders, many of whom have gone on to be some of the top riders in the peloton. Who's the team with the most to owe to Highroad? That'd be Sky, who has 9 riders who spent time at some incarnation of Highroad. Omega Pharma-Quickstep and Lotto Belisol each have 7. 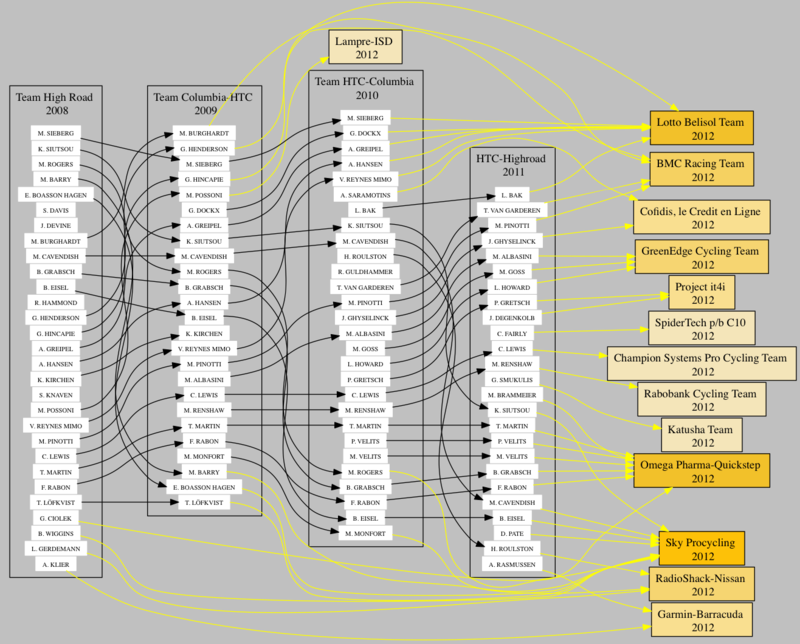 BMC has 4, while GreenEdge and RadioShack-Nissan each clock in at 3. Garmin-Barracuda, Cofidis and Project it4i have 2, and Katusha, Lampre, Rabobank, Champion Systems and SpiderTech each have 1. After reading that Bradley Wiggins raced conservatively in wet conditions at the prologue time trial of Paris-Nice on Sunday, I wondered whether the poor conditions led to average slower times in the time trial. 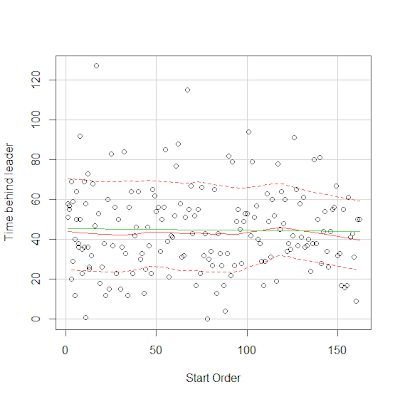 A scatter plot of start order on the horizontal axis to time behind the leader on the vertical axis shows that there's no discernible upward trend as the day carried on. The green line shows the overall trend. It stays horizontal rather than sloping upward - showing that the times were pretty much consistent throughout the afternoon, though the weather was changing. Why? There are many reasons why. First, superior time trialists started toward the end of the order. If the weather slowed riders down, time trial specialists' faster times could have evened out the trend. Secondly, weather can have a lot of effects. Heavy rain slows a rider's speed, and wet roads forces a rider to corner conservatively. However, rain also reduces humidity in the air, lowering the air resistance. Wet roads also lead to less rolling resistance - meaning, faster rides. A rider might be fastest right after a rain shower. A more thorough analysis would shed more light on the question, but based on a quick analysis I feel confident saying that though really foul weather might slow riders down, wet or simply poor weather might not have a significant effect on time trial performance. Statisticians and others, feel free to chime in. NB: I removed Nick Nuyens from the data since he crashed and finished over 6 minutes down in a ~12-minute time trial. Blue box: Did time with Saxo. Red box: did time with Radio Shack. Cyan box: Leopard-Trek. Interesting to note: in the 2010-2011 transfer, only 3 riders from Saxo 2010 didn't end up at Leopard-Trek or Saxo 2011. Matti Breschel went to Rabobank, Alex Rasmussen to HTC, and Frank Høj retired after failing to come to an agreement with Riis for 2011. 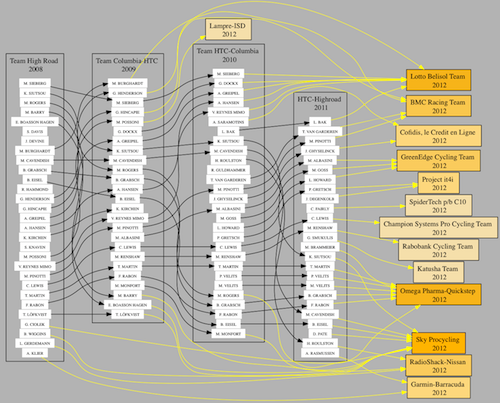 Statistical analysis of Pro Cycling teams, races and riders. Copyright Squadralytics 2012 - All rights reserved.